Weiss Pediatric Care has added routine cutting edge Automated “Spot Vision” Screening for infants, young children, and those with special needs. By offering the latest technology, we are taking a leadership role in the community to identify vision issues that might otherwise hamper children’s ability to learn and even lead to blindness. 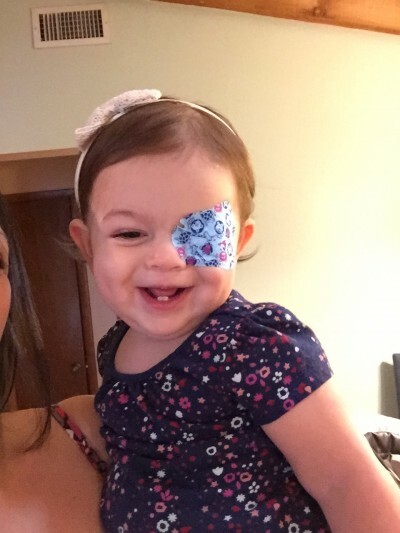 At her one year old well check, Lena was among Weiss Pediatric Care’s first children to be diagnosed with amblyopia using the Spot Vision technology. Many thanks to Lena’s mother, Holly, for telling their story. In November, we saw Dr. Weiss for my daughter’s 1-year well visit. One of my current concerns about her health was that I thought I saw her left eye drift outwards when I put her in the car seat or when she was looking at me from far away. Both my husband and my friends thought I was being paranoid. They never seemed to see her eye drift like I did- or thought I did. My sister and I both had a “lazy eye” when we were little, so I wasn’t sure if I was being observant or just hyper sensitive. He brought the machine into the room, and within seconds he was able to confirm that my daughter’s eye did “drift” (by approximately 8 degrees). Minutes later, Dr. Weiss provided me with a snapshot of what the “Spot Vision” tool was able to detect in my daughter’s eyes and a referral to a pediatric eye specialist. 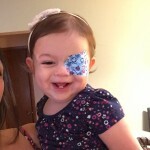 Only a few weeks later, the eye specialist further diagnosed my daughter with having a “lazy eye” and instructed us to begin treatment with an eye patch. We put the patch on alternating eyes for 2 hours each morning. Once the patch is on, my daughter is off and playing without any further attention to the material adhered to her face. We will revisit the eye specialist after 3 months, but after only 3 weeks of patch wearing, I am certain that I already see an improvement! I am thrilled that, thanks to Dr. Weiss and the Spot Vision technology, we are able to begin treatment of my daughter’s drifting eye immediately. With early intervention, we are avoiding the risk of permanent eye-brain connection issues, and greatly reducing the possibility of needing surgery. Any information I find online about infants with Lazy Eye says it is best to diagnose and treat before age two. It’s unlikely we would have started taking our daughter to an eye-doctor at such a young age. Thankfully, Dr. Weiss has advocated for technology that can detect pediatric problems not usually given attention to at the physician’s office – I know my “whole” child is in great hands. More About Spot Vision Automated: The Spot Vision Screener is a battery powered photo screener that resembles a digital camera. Using lights and sounds to help engage children, it screens both eyes at once from a nonthreatening 3-foot distance. Designed specifically for infants, young children, and those with special needs, it instantly and reliably detects the most common, treatable sight threatening conditions such as: refractive errors (nearsightedness, farsightedness, unequal power & astigmatism), amblyopia (lazy eye), strabismus (crossed eyes) and media opacities (cataracts).